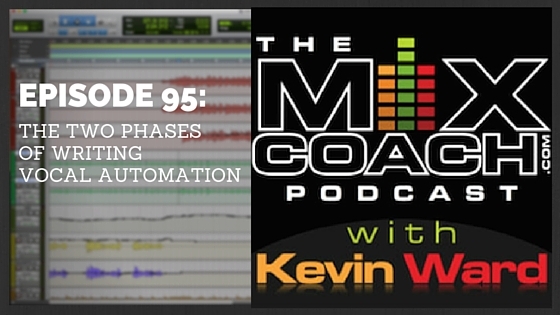 On this episode of the podcast Kevin discuses his mindset while automating vocals. He talks about the two main phases of automating or “riding” vocal faders, and explains what he tries to accomplish in each stage. Check out this episode to find out more about vocal automation! 1) Keeping the vocal at a consistent level where you can hear it above the music. 2) Riding the vocal for intelligibility, so that you can clearly hear and understand every word. Check out these links for more information on automating vocals, and the hierarchy of mixing. MixCoach Minute 20: What is the correct order for Mixing?